HIGH PREMIUM MATERIAL : Inside filled with compression-resistant EPE pearl wool plus outside covered with thickened PU leather which achieve healthy, durable and better resilience, not easy distorted . The thickened PU leather cover is toxic-free, non-slip, waterproof, crack-resistant, which is long-lasting enough to protect inner pearl wool and mildew resistant to provide sanitary protection. EXERCISE WITH COMFORT: With three inches thick EPE pearl wool, keep your knees, wrists and back comfortable throughout your activities. Efficient in absorbing the impact on your joints and muscles during jumping, rolling, or high intensity workouts. WIDELY USE: Covering a wide range of sports and exercises. Not only for gymnastics but also for pilates, stretching, yoga, martial arts, day care activities and many other general exercise, all in one mat. Also, it is an ideal as kid’s play mat or temporary sleeping or sitting mat when you are exhausted after exercise. All in one mat, will take care of all your workout needs. 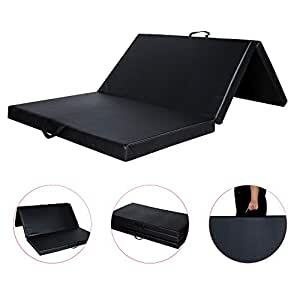 FOLDABLE AND ZIPPER DESIGN: Homevibes gymnastics mat features humanized design with reinforces carrying handle and foldable construction. Expand Size: 4’x8’x3″, Folding Size: 4’x2.7’x9″. 3 panels design is compact for storage and save space in storage. LIFE-TIME WARRANTY: Your purchase includes a hassle-free Money Back Guarantee and a free replacement exchange life time. If the mat gets damaged, just feel free to contact our customer service team with a photo, we are willing to replace it FOR FREE. Have Questions? Need Help? Just send us an email, you’ll have our full attention within 24 hours.